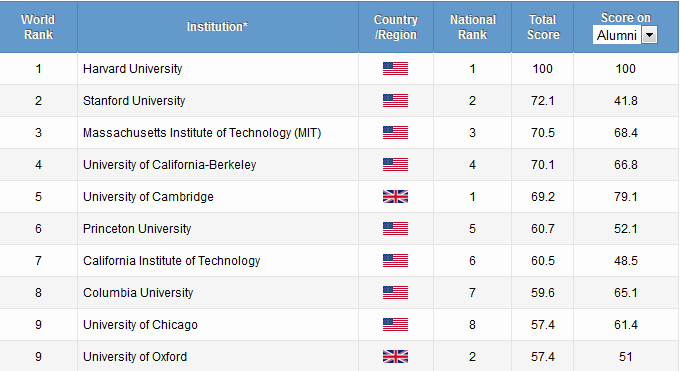 The Shanghai rankings also showcase strengths in particular subject disciplines, providing additional tables of the world’s top 200 universities in the fields of natural science and mathematics; engineering/technology and computer sciences; life and agricultural sciences; clinical medicine and pharmacy; and social science. In addition, subject rankings are produced for mathematics, physics, chemistry, computer science, and economics. The reaction to the annual Shanghai rankings – both at a national and an institutional level – is often as interesting as the tables themselves. In the United Kingdom, for example, there was concern in the wake of this year’s ARWU that the country might not be investing sufficiently in higher education, especially compared to other countries. Reports in India, meanwhile, lamented the country’s showing in this year’s rankings. The Hindustan Times expressed disappointment that only one Indian university placed in the top 500 (Bangalore’s Indian Institute of Science at 327). As we observed recently, the release of any ranking table is bound to generate discussion, particularly around questions of methodology. Our earlier report quoted Connell Monette, Assistant Vice President for Academic Affairs at Al Akhawayn University in Morocco, who noted that rankings can be an effective measure of quality but that understanding the methodology behind the ranking table is critical. It is fair to say that given the number of university ranking systems that currently exist – a figure only set to grow in the years ahead – interpreting the wide-ranging results (and the qualities and characteristics that they reflect) can be a challenge. While many feel the Shanghai list provides one of the more objective ranking systems, as it uses only publicly available data and does not incorporate reputational factors, critics feel the system still maintains a bias toward certain types of institutions, due in part to its heavy reliance on science-oriented ranking factors. The same report from RFI notes that the Shanghai rankings have been criticised in the past for not taking into account the “quality of education” or “employability of students.” France, it says, has recently announced it is working on its own system of ranking universities. This entry was posted in Africa, Asia, Australia/Oceania, Europe, Higher Education, Middle East, North America, Regions, South & Central America, United States and tagged Southeast Asia, Egypt, postgraduate student recruitment, university rankings, international students.